Motivering tillgänglig endast på engelska. 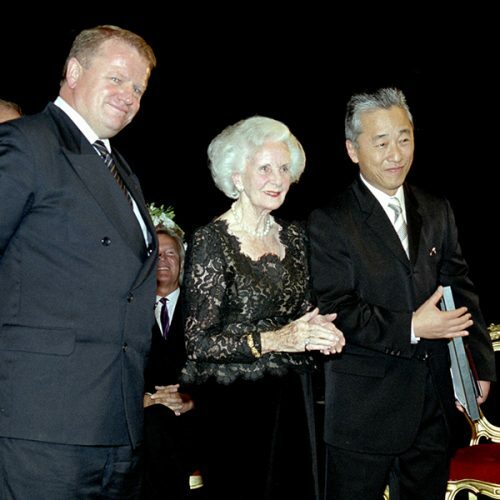 The Hasselblad award was presented for the 21st time on Saturday 20 October 2001. The award winner, Hiroshi Sugimoto, Tokyo, received the award from Her Royal Highness Princess Lilian, at a ceremony at the theater Storan in Göteborg. The award sum was SEK 500,000. In conjunction with the ceremony an exhibit of the award winner’s work, Hiroshi Sugimoto – 2001 Hasselblad award winner, opened at the Hasselblad Center at the Göteborg Art Museum. Hiroshi Sugimoto is one of the most respected photographers of our time. In his main photographic themes – the interrelated disciplines of art, history, science and religion – Sugimoto combines Eastern meditative ideas with Western cultural motifs. In the past 25 years Sugimoto has reached audiences around the world with his distinctive, carefully composed series in black and white. Inspired by Renaissance paintings and early 19th century photography, and using a large format camera, Sugimoto achieves a wide range of tones in a body of work that reflects his great love of detail, his outstanding technical mastery and – above all – his fascination with the paradoxes of time.